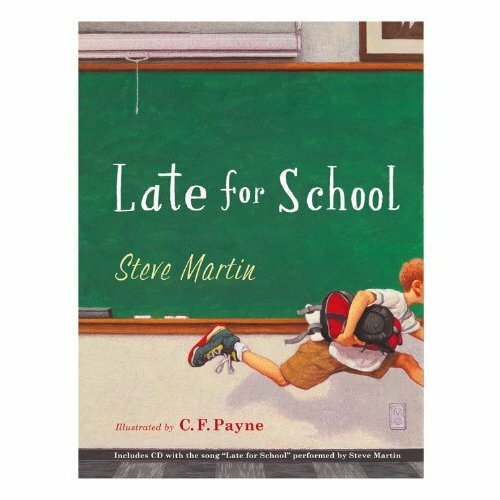 Actor/comedian/author Steve Martin writes this story about a boy taking an adventurous route to school to avoid being late and ending up in the “English grammar slammer” as a song. He jumps through pools, does some log-rolling and even catches a ride on a kite. There’s a CD included with Martin performing Late for School on the bango which should make reading this story that much more fun for young readers. The illustrations by C.F. Payne give the picture book a Norman Rockwell-esque old-fashioned look. And the vocabulary that Martin includes is commendable. Words such as: accelerate, meteor, ricochet, aviate and evaporate. My five-year-old nephews should enjoy Late for School as read to by my nine-year-old niece Arden will read to them. This entry was posted on October 12, 2010, 22:24 and is filed under Books. You can follow any responses to this entry through RSS 2.0. Both comments and pings are currently closed.